965 backers pledged $85,130 to help bring this project to life. For all post-KS updates, please go to either judgesguild.org, or our Facebook Page. The Wilderlands Player's Guide will include all the extra rules JG has come up with over the years from our past products like Ready Ref Sheets, the races of the Wilderlands, new classes (for old-school) or Prestige Classes (for PFRPG), and that kind of thing. They will be also JG Universal or PFRPG. City State of the Invincible Overlord, the first and one of the largest fantasy RPG city settings in gaming history, written by Judges Guild founders Bob Bledsaw and Bill Owen, defines sand-box roleplaying by giving information for over 350 shops, taverns, inns, palaces, barracks, temples, and the NPCs who inhabit them! City State of the Invincible Overlord was first released at Gen Con IX in 1976, along with Wilderlands Campaign Map I: The City State. The City State was written for the Judges Guild's Wilderlands of High Fantasy Campaign Setting but can be easily adapted and dropped into any setting. The Original City State of the Invincible Overlord cover from 1977. Judges Guild is now giving you the opportunity to help bring what has been described as the "gold standard for urban sourcebooks", City State of the Invincible Overlord to the Pathfinder Roleplaying Game and re-imagine Wilderlands Campaign Map I: The City State with your generous pledges. This update of the City State of the Invincible Overlord will also include material from our products Wraith Overlord (for those who wish to clear out the sewers underneath the City State), Thunderhold (the dwarven citadel, north of and allied with the City State), and Modron (a walled town, city of the River Goddess, on the perilous Estuary of the Roglaroon). To complete this project, we need $28,000 to print and illustrate the book, to revamp Wilderlands Campaign Map I: The City State, for Kickstarter fees, and pledge fulfillment. Those who've pledged at $20 or above will receive all unlocked Stretch Goals maps in PDF/Hi-Res JPEG for free. For those who are international backers, there is a separate $20 level pledge that does not include physical items to keep you from paying international shipping charges. Those who are pledging at $60 or above will receive what was mentioned above along with PDFs of the unlocked Wilderlands books for free. Those who are pledging at $250 or above will receive what was mentioned above along with all unlocked Campaign Maps in physical form. Because some of the stretch goals are as far out as Jun 2015 for delivery, you can break up what you receive into 2 or 3 shipments and pay extra for shipping or receive everything at once with no extra shipping and handling. The goals for now is to get this project funded! Below you can see our Stretch Goals! For every $3k above our goal a new Wilderlands Campaign Map will be unlocked until all 18 are released! Everyone at or above a $20 pledge level will get free PDF/Hi-res Jpeg versions of all unlocked Wilderlands Campaign Maps! 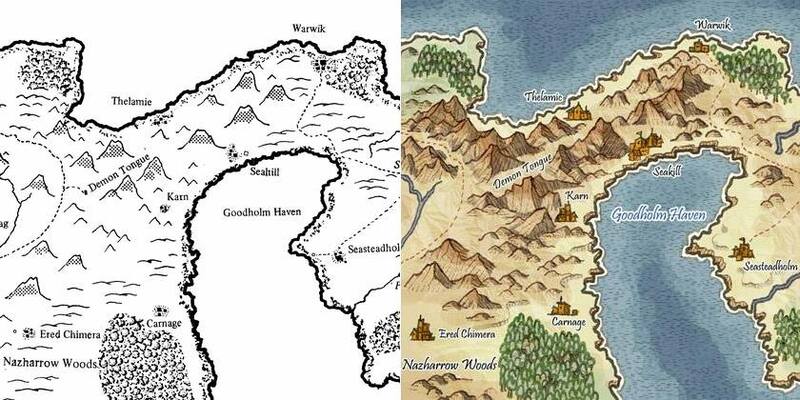 For physical copies of the unlocked Wilderlands Campaign Maps, please add $5.00. An additional $10 (domestic) or $20 (international) will be needed forshipping if your pledge level does not include shipping a physical item. Also those who pledge at or above the $250 level will receive free physical copies of all unlocked Wilderlands Campaign Maps! The Miniatures will be done by Eastern Front Studios in your choice of Metal or Resin at 28mm base. There will be a set of 8 depicting Dwarves of Thunderhold, and another set of 5 depicting the Orcs of the Purple Claw! Miniatures will available for international shipping, but the backer must pay the actual shipping costs. You could either have everything delivered by May 2015 in one package for no extra shipping, or have them delivered as they are available for extra shipping. A total of 4 large format maps! That makes this version of the City State a compilation of 4 of our past products! This version of the City State of the Invincible Overlord is going to include expanded content. We've used the original City State of the Invincible Overlord, Wraith Overlord, Thunderhold, and Modron as a framework. Then we've expanded on that framework in a way that does not take away from that original Judges Guild sandbox feel. It has really helped fill the gaps to make the presentation and flow of the product more natural. Below are some sample illustrations from the book! Our Wilderlands Campaign Maps detail one of the largest and expansive settings in the industry. Your generous pledges will allow us to overhaul the way our maps look and feel. Wilderlands Campaign Map I: The City State will be 17" x 22" double-sided (in color). One side will be a practical, yet beautifully done map by Rob Conley of Bat in the Attic Games utilizing the Campaign Hexagon System. The other side will be more artistic in nature, yet will have faint 5 mile hexes to assist in the determining of distances should you choose to use it instead. All unlocked Maps will be done in the same manner. Once the stretch goals are unlocked for the Judges Guild Miniatures from Eastern Front Studios you'll be able to add your choice of minis to your pledge for $10 each. If you add on all 13, you can get them for $100! Just remember to add shipping if your pledge does not already contain physical items. The Dwarves of Thunderhold will be available with the pledges released 3/26/2014. Miniatures will be available for International Shipping, but the backer must pay the actual shipping costs. Thunderhold Dwarf #2 - the Female! Hardcover and Softcover version of the City State of the Invincible Overlord Book. The Hardcover will not be signed or numbered. PDF of the City State of the Invincible Overlord. Domestic and International Shipping included. Choice of 1 of the Miniatures! International backers must pay actual shipping. Choice of 3 of the Miniatures! International backers must pay actual shipping. Choice of 5 of the Miniatures! International backers must pay actual shipping. Choice of 8 of the Miniatures! International backers must pay actual shipping. Choice of 13 of the Miniatures! International backers must pay actual shipping. #1 The City State Region: We started in the region occupied by the City State of the Invincible Overlord. A land with influences from man, elf and dwarf alike. The geography ranges from plains, to marshes, to woods, hills, and mountains. Notable cities and towns are Thunderhold, Modron, Tegel Village, Ossary, Lightelf, Sea Rune, and more. Forces from the City State engage in the Pirates up and down the River Hagrost, the Orcs of the Purple Claw, the Skandik Raiders of the East, and others. #2 Barbarian Altanis: The area known as Barbarian Altanis is home of the nomadic, red-skinned Altanians. Their ancestors were more advanced technologically, but their civilization had crumbled long ago leading to tribal feudalism. Now they wander the wastelands of the fathers. The ruins of the Kingdom of Kelnore are found in this regions as well. Mostly uninhabitable due to the thick wooded terrain, dense jungle, hills and mountains, there are very few outposts from the Invincible Overlord found here and there. Strewn across the region are many isolated villages of tribes and cults, Skandiks and orcs, and even a few pirates. #3 Isle of the Blest: Wilderlands Campaign Map XII: Isle of the Blest details the southern part of the Pazidan Peninsula and the Isle of the Blest. The fingers of the peninsula are known as Oricha, ancient home of the Orichalan Dragon Kings before the Altanian Barbarians killed all but few. The Isle of the Blest contains the City State of the Sea Kings, Rallu (on Campaign Map XVII: The Silver Skein Isles). The seas in the area have many traders going to Tarantis or Rallu, sometime even Tula, the City State of Mages. As with any place where traders are about, the seas of the Isle of the Blest are rife with pirates! The populations tend to be a mix of Alryans, Altanians, Tharbrians, and the occasional Antillian. Isolated settlements of Dwarves and Halflings are here and there as well. Navigating the hundreds of islands can be dangerous without proper equipment, navigators, and charts! #4 Ghinor: Land of sea storms, dangerous reefs and shoals, jungles teeming with feral dwarves, and the City State of Chim. This City State is located on the Devilstongue Peninsula. Long ago, this area was the Ghinorian Successor States, originally belonging to the Kelnorian Empire until a prince granted himself autonomy from the empire. Chim had sat empty for many years but has been settled by a tribe of dwarves. #5 Silver Skein Isles: Campaign Map XVII: Silver Skein Isles details Rallu - the City State of the Sea Kings located at the tip of the Isle of the Blest, Tula - the City State of Mages located along the coast of the Southern Reaches, and the actual Silver Skein Isles. The population is mostly Ghinorian men who often oppress the fairly small Karakhan minority. There are 6 large and 28 small islands that make up the Silver Skein Isles. Rallu and Tula have been in a power struggle for a while. Rallu is home of the Kelnorian descendants known as the Sea Kings, and Tula is home to many of the famed Schools of Wizardry, and the Chromatic Mages. Aside from the Rallu-Tulan War, there is an even longer enmity between the religious powers of the Silver Skein Isles. #6 Isle of the Dawn: The Isle of the Dawn has been of religious significance to the followers of Apollo as they believe here is where his Sun Chariot, Helios to the Ghinorians and Hyperion to the Skandiks, originates in the sky. Most of the human settlers here have lost touch with their peoples' history. No major political power is present in this region because of the vast distances of sea between islands. Whaling vessels are pretty common here. Dragons, Mer-elves, Suhägin, schools of glowing fish, and dolphins are about! #7 The Ebony Coast: The Ebony Coast is a peaceful region rich with coal, crude oil, and peat. This land is wet in spring and early summer causing some swells and minor flooding. Mild winters are often accompanied by rain in the lowlands, but heavy snows in the highlands. Merchant and political influences have made for a vast network of roads between cities, villages and settlements to ease trade and patrol. Revelshire is the main political power here. Due to the geographic position of the Ebony Coast, it lies at the center of many different spheres of influence making it very diverse racially. These include Some Alryans and Karzulun tribesmen, but mostly Gishmesh, Antillians, Ghinorians and Skandiks. The south has a significant Karakhan influence with two outposts on Moonstone and Blackwell Isles. #8 Tarantis: This is the region containing the City State of Tarantis, ruins of what is rumored to be the capitol of the Kingdom of Kelnore, the Terad Mountains, the Silver Sea, Shadow Lake, and the Jarmeer Plain. The Tarantine Merchant's Association is based here. Weather tends to be warm and humid in the west and dry and hot in the east. The Jameer Plain is known for its almost daily occurrence of tornadoes. The city state of was founded 2541 years ago by the two nomadic tribes, the Gishmesh and Paldorians. The current dynasty ruling Tarantis was founded just under a hundred years when Edario I overthrew the sickly child Emir, Greataust II. Now Edario's son, Atar the Lion, is Emir of Tarantis, having ruled successfully for over 48 years. Many of the provincial rulers in the Tarantis region are Sultans in treaty with Atar the Lion. #9 Valley of the Ancients: According to the mythologies of men, and the ancient records of the Elves, the Valley of the Ancients was the place of genesis for the first creatures to walk the earth, the dragons. The prehistoric wars between dragons and the Markrabs raged here. Now, only rangers and hunters explore these poisoned lands. Thick fog obscures the sight of many travelers, leading to the naming of the Glow Worm Steppes. It is rumored that large carrion grubs which give off a bioluminescent glow can be seen making their way through the plains at night. In actuality, these are the hunting parties of cavemen armed with torches, mounted upon their ponies. Races found here include the Tenifell Lords, the Rangers of Tarsh, the Tarshian peoples, Avalonians (both common and true), and other mixed men so far removed from any particular race that they cannot be accounted for. #10 Valon: Valon is just south of the Great Glacier which has been receding the last thousand years making the Valonian rivers and streams rich with glacial deposits of gold, and silver. Iron, mithral, and copper are also found in the mountains. The Heareat Undersea Kingdom, populated by the Avalonians, resides under the Uther Pentwegern Sea. Pirate hole up in Malikarr, the City of Alchemists, on the Isles of Pokrantil, and on Thrinakia Isle between sorties. Malikarr is also where the last of the Orichalan dragons reside (in polymorph form) teaching their ancient alchemical knowledge. The City State of Valon is the greatest regional power here, known for its great weather wizards. Heavy rains and snows are frequent year round, and its large desolate landscapes make the region unappealing to foreigners. The thick cloud cover year round doesn't add to Valon's appeal either. The bitter cold during the winter causes the Ninuflan Bay to completely ice over. The Downland Plain is typically covered with 10-15 feet of snow during this time. #11 The Elphand Lands: The terrain here is divided between three major rivers and lakes. Mountains, hills, and dense woodlands populate most of the land. Some grasslands and bogs can be stumbled upon as well. Due to the variances in terrain and altitude, attempts to send communication are hazardous. This makes self-sufficiency the biggest factor in survival. Elphand cavemen can be found in the wilds, and the human race of Confeds are spread throughout the area. Demi-Giant settlements to the north and east of the Elphand Lands are responsible for the occasional raid. Wild mastadons, sabre-toothed tigers, dire warthogs, worgs, and other fel beasts can be found hunting the forests and plains. The major political power here is the city of Damkina, which resides on the Vast Lake Island. Here rules the White Overlord. #12 Viridistan: Viridistan is known by many names in many regions due to its large sphere of influence. It is known as the Immortal City, the City of Spices, and the City State of the World Emperor. The Green Emperor and his wife rule Viridistan. They are the last known survivors of the True Viridians, a green-skinned race known for their innate ability to use powerful sorcery. A kingdom of merfolk, Sae Laamer can be found in the Trident Gulf. Common Viridians and Tharbrians are most common races in the lands around the City State of the World Emperor. Alryans, Altanians, and Skandiks can be found outside the city. #13 Desert Lands: The Desert Lands contains the Holy Cities which are considered one of the most sacred sites in the Wilderlands. The Holy Cities are currently occupied by forces from Viridistan as part of the Green Emperor's policy of oppression against the Mycretians. The Mycretians are humble followers of the god Mycr. Other races found here are mixed descendants of the Tharbrians, Alryans, and some Antillians with the native Dorins which occupy the regions west of the mountains. #14 Lenap: Lenap was also once part of the Ghinor Successor States. Terrain here ranges from desert to thick jungle and hills. The Isles of Flame are volcanic islands located in the Churning Sea, making the sea chaotic to traverse. The region is full of herbs, spices, plants, saps, perfumes, and oils that are not found elsewhere in the Wilderlands making trade very lucrative despite the occasional volcanic activity and frequent hurricanes in the spring and fall. #15 Sea of Five Winds: The City State of Tlan is found on the eastern coast. Tlan was also once one of the Ghinor Successor States, but has since fallen from its former glory. Large wooded hills make civilization sparse and road construction too expensive to fund. The mineral rich Vastern Canyon is in the northern part of this region, but the terrain has prevented extraction. Many unique and hard to find alchemical plants and herbs can be found in the Hutamah Jungle. #16 Ament Tundra: Although the Ament Tundra is closer to the equator of Ghenrek IV, it is bitterly cold, extremely windy due to the altitudes that the steep escarpments reach. The rugged topology of the Ament Tundra makes for a natural barrier from the Demi-Giant marauders to the west. It's been over a millennium since the Demon Empires in the south have invaded. There are no roads, making this region true wilderness, and reaching the upper slopes can only be done by climbing the shear cliffs and steep escarpments. #17 Southern Reaches: Most of the Ghinor Highlands are actually lowlands full of jungles, swamps and marshes. Over Doom Mountains are home to the Ironfoot Dwarves, the only real political power there is in the region. The dwarves don't mind travelers or settlers so long as they are not encroached upon. Demonic exiles from the Demon Empires southward can be encountered from time to time. Other villages tend to be small self-sufficient communities that keep to themselves. #18 Southern Reaches: The last 100 years has been rather peaceful for the once tumultuous Southern Reaches. The Demon Empires have not raided these lands in quite some time. The foreboding Bendalion Mountains are known to be rich in metal and gemstone alike, yet remain largely untouched due to the increasing numbers of monsters and feral men and dwarves who control it. Dwarven civilization has built up its influence in the western highlands, while the Elves reside on the eastern seaboard. The races of men here are typically Ghinorians. This place is hot, and heavy rains are frequent. The following are only challenges we think we are in the realm of possibility. The writing is already done for the book - so no issues there. The only thing that the book will need is illustrations and a final layout draft. What may potentially keep the book from going to print is illustration delivery delays. This would hold up the layout of the final product but can be mitigated by doing layout and illustrations in parallel instead of in series, or by printing the book with less illustrations. Printing will be done through the same printer that Frog God Games uses, so the quality of these books will be on par with theirs. However the maps will be done through a different vendor. Delays may occur if map and book deliveries do not arrive together resulting in a decrease of time available to rubber cement the maps in the book for reward fulfillment. Fortunately, we have back-up vendors in town that may help to compensate for the delays. We also plan to get these all printed and ready MONTHS in advance to ensure early, or at minimal timely delivery. Thank you for your support! You will have the option to add your name in the back of the book as a Skandik Raider. Thank you for your support! You will have the option to add your name in the back of the book as a Mage of Tula. Thank you! You will receive a PDF and Hi-Res JPEG of Campaign Map I: The City State and the option to have your name in the back of the book as a Tarantine Merchant. Minis #1: You'll get your choice of 1 of the Miniatures! International backers must pay actual shipping costs from home country. Thank you! You will receive a PDF and Hi-Res JPEG of Campaign Map I: The City State, a PDF copy of the City State of the Invincible Overlord book, and the option to have your name in the back of the book as a Sea Rune Shield-bearer. Thank you! You will receive the 17" x 22" Campaign Map I: The City State, a PDF and Hi-Res JPEG of the Map, a 4" x 6" - 100 sheet Grid Pad, and the option to have your name in the back of the book as an Altanian Warrior. This is the same as the $15 pledge level but for our international backers ONLY. This will qualify international backers to get all the unlocked stretch goal maps without having to pay for international shipping. Thank you! You will receive the 17" x 22" Campaign Map I: The City State, a PDF and Hi-Res JPEG of the Map, a PDF of the City State of the Invincible Overlord book, a 4" x 6" - 100 sheet Grid Pad, and the option to have your name in the back of the book as a Tharbrian Barbarian. Minis #2: You'll get your choice of 3 of the Miniatures! International backers must pay actual shipping costs from home country. EARLY BIRD SPECIAL: For those who wish to own the City State of the Invincible Overlord softcover book! You will also get a PDF of CSIO, and a PDF & Hi-res JPEG of Campaign Map I: The City State. Minis #3: You'll get your choice of 5 of the Miniatures! International backers must pay actual shipping costs from home country. Thank you! You will receive the City State of the Invincible Overlord softcover book, a PDF and Hi-Res JPEG of Campaign Map I: The City State, a PDF of the City State of the Invincible Overlord book, a 4" x 6" - 100 sheet Grid Pad, and the option to have your name in the back of the book as a Priest of Modron. EARLY BIRD MINIS: Get all 8 of the Dwarves of Thunderhold Minis for only $50! International backers must pay actual shipping costs from home country. Thank you! You will receive the City State of the Invincible Overlord softcover book, the 17" x 22" Campaign Map I: The City State, a PDF and Hi-Res JPEG of Campaign Map I: The City State, a PDF of the City State of the Invincible Overlord book, a 4" x 6" - 100 sheet Grid Pad, and the option to have your name in the back of the book as a Pirate of Hagrost. Minis #4: You'll get your choice of 8 of the Miniatures! International backers must pay actual shipping costs from home country. Minis #5: You'll get your choice of 13 of the Miniatures! International backers must pay actual shipping costs from home country. EARLY BIRD SPECIAL: For those who wish to own the City State of the Invincible Overlord hardcover book! You will also get a PDF of CSIO, and a PDF & Hi-res JPEG of Campaign Map I: The City State. Thank you! You will receive the City State of the Invincible Overlord hardcover book, the 17" x 22" Campaign Map I: The City State, a PDF and Hi-Res JPEG of Campaign Map I: The City State, a PDF of the City State of the Invincible Overlord book, a 4" x 6" - 100 sheet Grid Pad, and the option to have your name in the back of the book as a Priest of Pegana. BLACK LOTUS OF THE INVINCIBLE OVERLORD: Thank you! You will receive the City State of the Invincible Overlord in a limited edition hardcover. These will be numbered 2-150 and signed by Bob Bledsaw Jr. and Bob Bledsaw III. You will also receive a softcover copy, the 17" x 22" Campaign Map I: The City State, a PDF and Hi-Res JPEG of Campaign Map I: The City State, a PDF of the City State of the Invincible Overlord book, 3 - 4" x 6" - 100 sheet Grid Pads, and the option to have your name in the front of the book as a member of the Black Lotus. BLACK LOTUS OF THE INVINCIBLE OVERLORD: This will get you a Hardcover and Softcover version of the City State of the Invincible Overlord Book and also PDF. The Hardcover will not be signed or numbered. You will also receive all unlocked maps in 17"x22" and in PDF/Hi-Res Jpeg. You will also receive all unlocked miniatures, and unlocked Wilderlands books in Softcover and PDF! 3 - 4" x 6" - 100 sheet Grid Pads, and the option to have your name in the front of the book as a member of the Black Lotus. You'll receive your items in two shipments, one by Nov 2014 and the second by July 2015. Domestic and International Shipping included. DWARVEN KING OF THUNDERHOLD: Thank you, so much! You will receive the City State of the Invincible Overlord in a limited edition hardcover. This will be numbered 1 and signed by Bob Bledsaw Jr. and Bob Bledsaw III. You will also receive a softcover copy, the 17" x 22" Campaign Map I: The City State, a PDF and Hi-Res JPEG of Campaign Map I: The City State, a PDF of the City State of the Invincible Overlord book, 5 - 4" x 6" - 100 sheet Grid Pads, and the option to have your name in the front of the book as the Dwarven King of Thunderhold.